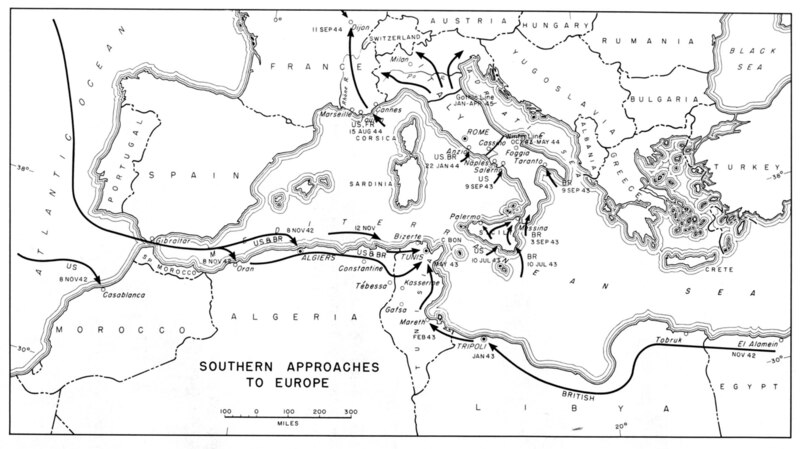 Although the decision to launch Operation TORCH had been made largely because the Allies could not mount a more direct attack against the European Axis early in the war, there were specific and attractive objectives�to gain French-controlled Morocco, Algeria, and Tunisia as a base for enlisting the French empire in the war, to assist the British in the Libyan Desert in destroying Axis forces in North Africa, to open the Mediterranean to Allied shipping, and to provide a steppingstone for subsequent operations. ward against General Eisenhower's Allied force. Although the Italian high command in Italy exercised loose control, the Axis nations failed to establish a unified command over these two forces. Where the Allies were to go after North Africa had already been decided in January 1943 at the Casablanca Conference. As with the decision to invade North Africa, the next step�invading Sicily (Operation HUSKY)�followed from recognition that the Allies still were unready for a direct thrust across the English Channel. Utilizing troops already available in North Africa, they could make the Mediterranean safer for Allied shipping by occupying Sicily, perhaps going on after that to invade Italy and knock the junior Axis partner out of the war. Because Sicily was an obvious objective after North Africa, complete strategic surprise was hardly possible, but bad weather helped the Allies achieve tactical surprise. As a huge armada bearing some 160,000 men steamed across the Mediterranean, a mistral�a form of unpredictable gale common to the Mediterranean�sprang up, so churning the sea that General Eisenhower was for a time tempted to order delay. While the heavy surf swamped some landing craft and made all landings difficult, it put the beach defenders off their guard. Before daylight on July 10, both British and Americans were ashore in sizable numbers. Anxious to find a way out of the war, a new Italian government made contact with the Allies through diplomatic channels, leading to direct talks with General Eisenhower's representatives. The Italians, it soon developed, were in a quandary�they wanted to pull out of the war, yet they were virtual prisoners of German forces in Italy that Hitler, sensing Italian defection, strongly reinforced. Although plans were drawn for airborne landings to secure Rome coincident with announcement of Italian surrender, these were canceled in the face of Italian vacillation and inability to guarantee strong assistance in fighting the Germans. The Italian government nevertheless agreed to surrender, a fact General Eisenhower announced on the eve of the principal Allied landing on the mainland. Because the build-up for a cross-Channel attack�the main effort against Germany�was beginning in earnest, the Allies could spare few additional troops or shipping to pursue the war in Italy. Through the fall and winter of 1943-44, the armies would have to do the job in Italy with what was at hand, a total of eighteen Allied divisions. Provided support by a French corps equipped with American arms, General Clark pulled out the U.S. VI Corps under Maj. Gen. John P. Lucas to make the envelopment. While the VI Corps�which included a British division�sailed toward Anzio, the Fifth Army launched a massive attack aimed at gaining access to the Liri valley. Although the VI Corps landed unopposed at Anzio on January 22, 1944, the attack on the Winter Line gained little. Even as the Allied ground campaign was proceeding on the shores of the Mediterranean, three other campaigns were under way from the British Isles�the campaign of the U.S. Navy and the Royal Navy to defeat the German submarine, a U.S.-British strategic bombing offensive against Germany, and a third, intricately tied in with the other two, a logistical marathon to assemble the men and tools necessary for a direct assault against the foe. tinued to lead the Germans to believe that this was only a diversionary assault, that the main landings were to come later on the Pas de Calais. Only in one instance, against the British who were solidly ashore, did the Germans mount a sizable counterattack on D-day. The arrival of the Third Army signaled a major change in command. General Bradley moved up to command the I2th Army Group, composed of the First and Third Armies, while his former deputy, Lt. Gen. Courtney H. Hodges, assumed command of the First Army. Montgomery's 21 Army Group consisted of the British Second Army and a newcomer to the front, the First Canadian Army under Lt. Gen. Henry D. G. Crerar. General Montgomery continued to function as overall ground commander, an arrangement that was to prevail for another five weeks until General Eisenhower moved his headquarters to the Continent and assumed direct command of the armies in the field. gomery's 21 Army Group by sending the First U.S. Army close alongside the British, thus providing enough strength in the northern thrust to assure quick capture of ports along the English Channel, particularly the great Belgian port of Antwerp. Because the front was fast moving away from Brittany, the Channel ports were essential. There were obstacles other than supply standing in the way of that goal. Some were natural, like the Moselle and Meuse Rivers, the Vosges Mountains in Alsace, the wooded hills of the Ardennes, and a dense Huertgen Forest facing the First Army near Aachen. Others were man made, old French forts around Metz and the French Maginot Line in northeastern France, as well as dense fortifications all along the German border�the Siegfried Line, or, as the Germans called it, the West Wall. By mid-September the First Army had penetrated the West Wall at several points but lacked the means to exploit the breaks. 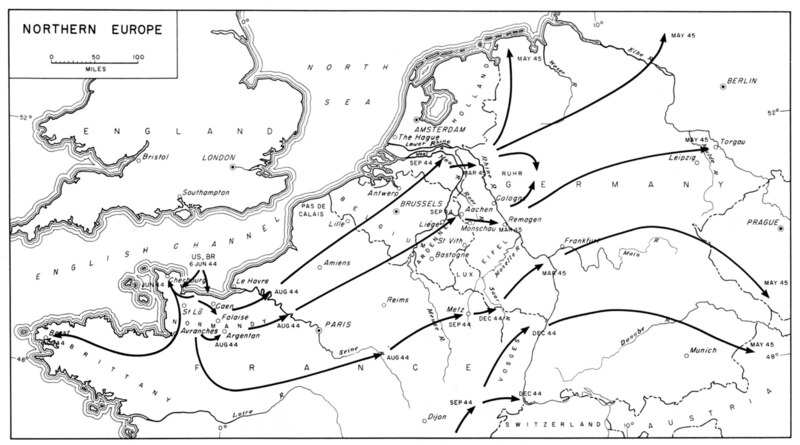 Although General Eisenhower assigned first priority to clearing the seaward approaches to Antwerp, he sanctioned a Montgomery proposal to use Allied airborne troops in a last bold stroke to capitalize on German disorganization before logistics should force a halt. While the British Second Army launched an attack called Operation GARDEN, airborne troops of a recently organized First Allied Airborne Army (Lt. Gen. Lewis H. Brereton) were to land in Operation MARKET astride three major water obstacles in the Netherlands�the Maas, Waal, and Lower Rhine Rivers. Crossing these rivers on bridges to be secured by the airborne troops, the Second Army was to drive all the way to the Ijssel Meer (Zuider Zee), cutting off Germans farther west and putting the British in a position to outflank the West Wall and drive into Germany along a relatively open north German plain. Far greater masses of troops were employed in the east than in the west over vast distances and a much wider front. The Germans had to maintain more than two million combat troops on the Eastern Front as compared with less than a million on the Western Front. Yet the Soviet contribution was less disproportionate than would appear at first glance, for the war in the east was a one-front ground war, whereas the Allies in the west were fighting on two ground fronts and conducting major campaigns in the air and at sea, as well as making a large commitment in the war against Japan. At the same time, the United States was contributing enormously to the war in Russia through lend-lease�almost $11 billion in materials, including over 400,000 jeeps and trucks, 12,000 armored vehicles (including 7,000 tanks, enough to equip some 20-odd U.S. armored divisions), 14,000 aircraft, and 1.75 million tons of food. As V-E Day came, Allied forces in Western Europe consisted of 4 ½ million men, including 9 armies (5 of them American�one of which, the Fifteenth, saw action only at the last), 23 corps, 91 divisions (61 of them American), 6 tactical air commands (4 American), and 2 strategic air forces (1 American). The Allies had 28,000 combat aircraft, of which 14,845 were American, and they had brought into Western Europe more than 970,000 vehicles and 18 million tons of supplies. At the same time they were achieving final victory in Italy with 18 divisions (7 of them American). While the Germans had developed a flying bomb and later a supersonic missile, the weapons with which both sides fought the war were in the main much improved versions of those that had been present in World War I�the motor vehicle, the airplane, the machine gun, indirect fire artillery, the tank. The difference lay in such accouterments as excellent radio communications and in a new sophistication, particularly in terms of mobility, that provided the means for rapid exploitation that both sides in World War I had lacked.